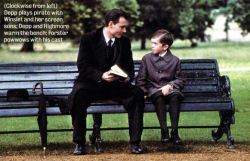 Will the tear-jerking drama Finding Neverland bring Academy Award glory to Kate Winslet, Johnny Depp, and newcomer Freddie Highmore? Clap your hands if you believe! If anyone out there has Johnny Depp’s address, please send him a DVD of Eternal Sunshine of the Spotless Mind. Though he clearly adores his Finding Neverland co-star Kate Winslet, he’s never seen the other movie that may earn her an Oscar nomination this year. “I’m going to see it for Kate,” he promises. “You’re so full of s---, I love it!” says Winslet, sitting nearby. Depp should hope the rest of the Academy doesn’t get so sleepy. 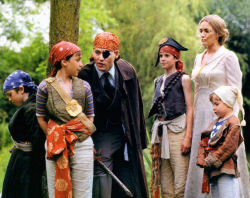 Just one year after scoring his first-ever Oscar nomination for Pirates of the Caribbean, Depp could find himself in the Best Actor race again thanks to his whimsical performance as Peter Pan playwright J. M. Barrie in Neverland. In the emotionally affecting drama (loosely based on true events), Barrie develops a friendship with ailing widow Sylvia Llewelyn Davies (played stoically by three-time nominee Winslet) and her four young sons, one of whom, named Peter, inspires Barrie’s most famous work. So far, the movie has won Best Film honors from the National Board of Review, as well as five Golden Globe nominations—one for each hankie it requires. On a wet and windy Friday afternoon in Paris (the halfway point between Winslet’s home two hours outside London and Depp’s villa in the south of France), the pair rolled their own cigarettes (one thing they do have in common) and chatted about the movie they wrapped two and a half years ago. 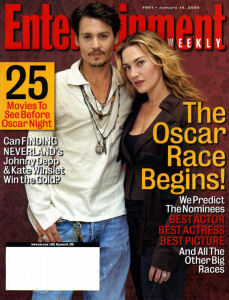 ENTERTAINMENT WEEKLY: Most people don’t realize you filmed Finding Neverland before Pirates of the Caribbean and Eternal Sunshine. How do you talk about something you made so long ago? JOHNNY DEPP: You lie. You make stuff up. KATE WINSLET: I’ve had another baby since then, so I’ve lost brain cells. So I had to go and watch the movie several times, just to have an understanding of what the whole thing was really like. Did you ever get impatient and want it to just come out already? Depp: I knew there had been some weirdness because of the Peter Pan movie (Universal’s 2003 fantasy, which contractually had to be released before Miramax’s Neverland). It started to feel like it was shelved or something, you know what I mean? Winslet: Also, as actors, you never get told anything, really. They just call you up when they need to roll you out on a few red carpets. 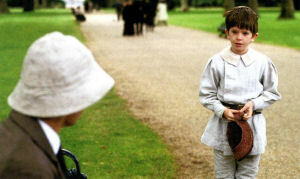 The movie has so many traditional tearjerker elements: fatherless children, fatal illness, the transporting power of art. What efforts did you make to temper that so it didn’t go over the top? Depp: We used to have these little sessions—Kate, myself, and Marc—where we’d go through the thing and locate the potential problem areas. 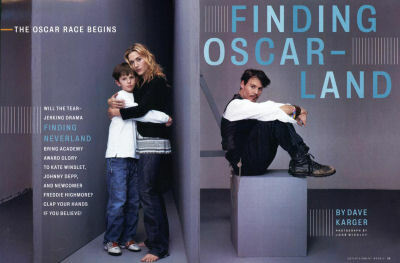 Winslet: Locate the smush. Sometimes we would just re-jig things a tiny bit, shave off a few edges, shortening lines here and there that perhaps made too much of a moment that could be said more simply by just seeing two people in a frame together. So there’s not an example of an entire scene that was taken out? Winslet: There was a scene that was taken out, actually. There’s a scene when we first arrive at the cottage in the country, and we’re sitting out side drinking tea and Johnny’s smoking a pipe . . .
Depp: I was getting ready to vomit from that pipe. Winslet: There’s a line that I say to Johnny, something along the lines of, “Sometimes I wonder if you realize how much you’ve come to mean to us all.” And he says, “Well, the boys are young.” And I say, “Yes, but for me.” If that scene had been kept in, the suggestion of something more intimate between them would have been much, much bigger. I love the fact that in the film, there’s never the clinch or the kiss or the moment. The movie indicates that Barrie and Sylvia’s friendship was quite the scandal in 1903. How do you think today’s society would react to such a relationship? Depp: Oh, Jesus Christ, we live in the era of reality shows and people are going to the toilet and millions of viewers watching. No, I don’t think it would be a shock. Winslet: I saw a show last night called Greatest Embarrassing TV Moments. And I’m sorry, I’m a sucker for all that stuff. So I’m sitting there and there was this guy on this show called Celebrity Detox. One thing they had to do was their own colonics. And then they had to push it through a sieve. This guy showed the world his poo. So I don’t know if it would be that shocking, necessarily. I noticed that Barrie very rarely touches or hugs the boys. Some people accused him of having inappropriate relationships with them. Did you make a conscious decision to limit your physical contact with them to avoid such talk today? Depp: That whole thing, I thought it was such a load of hearsay, like a nasty rumor that had been around since then. I don’t buy into that. I thought it would be really wrong to give any weight to that at all. Of course it had to be mentioned, it had to be dealt with. In one of Neverland’s few negative reviews, The New York Times critic said she didn’t think you were “pushed to [your] limits” in this movie. Depp: How does she know? That’s her opinion, but how does she know Kate’s limits or my limits, especially in the context of a story? Maybe it’s because you weren’t running down the streets naked and screaming. Depp: I do that on weekends. Winslet: Every character is different. Depp: You do what is called for. Winslet: Perhaps she was picking up on the fact that Marc was trying to get something that was quite subtle. His general feeling was: Let’s not act it up here just because we’re all doing a period film. I mean, Barrie’s not Edward Scissorhands. In the first scene, we see that Barrie gets intensely nervous before his play begins. Have either of you suffered from stage fright? Winslet: Most recently, can I just mention f---ing Saturday Night Live? Oh my God, it was so terrifying. They made me tap-dance, so if I missed a beat, that was it. Live, moment gone. Depp: My biggest stage-fright moment is anything where you have to go and talk in front of people. Doing the work on set, that’s fine. But an appearance, anything where there are a lot of people, especially if you have to say something. Even just standing there I feel like an idiot. Barrie’s wife in the film doesn’t understand or appreciate his creative side. Both of you, on the other hand, are involved with artistic people (Depp lives with pop singer Vanessa Paradis; Winslet is married to director Sam Mendes]. Do you think that’s important? Depp: Probably, on some level. For me, regardless of what your partner does for a living, whether they’re a singer or a director or a plumber, what’s important is that they have a passion for what they do. Vanessa and I never talk about our work. Winslet: It turns out that it is important, yeah, but I didn’t set out to find somebody who was involved in the same world as we are. It just increases the level of understanding that you can have with the person that you love. There’s nothing about what I do that I’ve ever had to explain to Sam because what he does for a living is understand actors. Barrie sees flashes of himself in Peter. Do you ever see yourself in your kids? Winslet: My daughter cam running up to me the other day and said [dramatically], “Mom, I have to tell you something. Just promise me one thing. When I’m a big girl, Mom, let me be in a movie! I know I can do it!” Beating her fists against my thigh. Kids. They make it all seem so easy.